Actinic keratosis is a rough, dry, raised, scaly patch of skin that is usually found on the face, scalp, back of the hands, chest, or other areas of the body that have been exposed to the sun for a long period of time. They start out as flat and scaly areas, and the growths may be gray, pink, red, brown, or the same color as the skin. As they develop, they often become hard and wart-like or gritty and rough. Sometimes the areas are easier to feel than see. 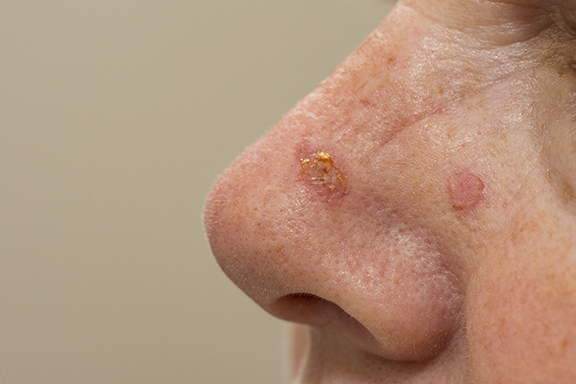 Actinic keratoses (AKs) are very common, especially among older adults. 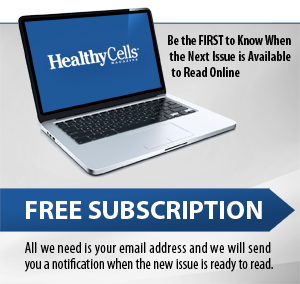 AK lesions are considered a pre-cancerous condition because some may develop into a type of skin cancer called squamous cell carcinoma (SCC). While this type of skin cancer is non-melanoma and not usually life-threatening, it can grow very aggressively and spread to other parts of the body, causing serious complications. SCC and AKs are actually the same disease process, but at different stages. Where AKs are confined to the outer most layer of skin, SCC will extend into the deeper layers of skin. Without doing a biopsy, it is practically impossible for a physician to determine which AKs might develop into cancer and which ones won’t. Therefore, it is recommended that people seek treatment for all AKs. Photodynamic therapy (PDT) is the newest treatment for actinic keratoses. It is a light treatment that is done in two steps. First, a topical medication (5-aminolevulinic acid) is applied to the affected area. The solution is absorbed by the AKs and non-melanoma skin cancer cells where it acts as a photosensitizing agent. The area is then exposed to blue light, which causes a chemical reaction that kills the damaged cells. These cells will then be replaced by healthy new cell growth. Photodynamic therapy is especially recommended when AKs appear in an entire area, such as the face, scalp, chest, or arms. When there are multiple AKs, treatment must address not only the visible lesions, but also the rest of the area that has also suffered solar damage and is in a precancerous condition. Photodynamic therapy is also used off label for facial rejuvenation. It is a relatively simple, highly effective treatment to reverse photodamage and clear precancerous skin lesions. Actinic keratoses are a common problem that will likely continue to rise as the population ages and the effects of sun damage become evident. The best way to lower your risk of actinic keratosis and skin cancer is to protect your skin from the sun and ultraviolet light by always wearing a broad spectrum sunscreen — even in the winter. If you do have actinic keratoses, it is important to understand the various treatment options available so that you and your dermatologist can determine the course of action that is best for you. All actinic keratoses cannot be treated in the same manner. The number of AKs, the amount of background photodamage, how long you have had them, your age, other medical conditions, history of skin cancer, as well as your own personal preference will all be factors in deciding on the appropriate therapy. If you only have a few isolated lesions, they may be treated by freezing the lesions and regular monitoring. But don’t ignore actinic keratoses and be sure to have all skin growths examined by a dermatologist. A dermatologist is best qualified to determine what conditions are harmless and what ones may lead to serious consequences.